The perfect house for large groups - either adult groups or two families. The house has five bedrooms (including a parents retreat upstairs) with three queen-size beds, a double bunk, two single beds and a portacot available (sleeps 10). Set on 3 hectares (8 acres) and adjoining rural and bush properties you have complete privacy. Facilities include fully equipped kitchen and laundry, two bathrooms, TV, video, DVD and stereo, outdoor heated spa on the veranda, BBQ and outdoor setting. Wood fire, gas and wall heating for winter and air conditioning for summer. The games shed contains pool and table tennis tables, table soccer, darts & hookey, and a TV - perfect for the kids or teenage children. There are beautiful views over the valleys from all sides of the veranda and native wildlife and bird life can be seen on the property. Ideal for a holiday with the family & friends. Pets are welcome and can be kept securely on the wide wrap-around verandah. Check out our reviews - no one has ever not loved staying at Tangerum! Tangerum is just over two hours from Melbourne and just 15km (10 mins) from Mansfield on Old Tolmie Road. It is about 30kms from Mt Buller. Close to historic Mansfield and the beautiful High Country including Mts Buller and Stirling, and King Valley and local wineries. In the middle of bushranger country with Stringybark Creek, site of the Kelly ambush, just up the road and Powers Lookout, hiding place of Harry Power, mentor to the young Ned Kelly, a short drive away. Try out any of the varied adventure activities such as horse riding, camel treks, hiking, snow and water skiing, white water rafting, ballooning and much more, all available in close proximity to Tangerum. Tarriffs quoted are for your entire group - no add-ons or hidden charges! Peak period pricing applies from 1st June to 30th September and all long weekends including Labour Day, Queen's Birthday, Easter, Christmas/New Year and Melbourne Cup weekend when all nights are charged at peak-period rates. Minimum stays apply. Tariff includes linen & towels. Check-in is normally 2:30 pm and check-out 11:30 am. If there is not a cross-over booking we are normally happy to extend these times either way. 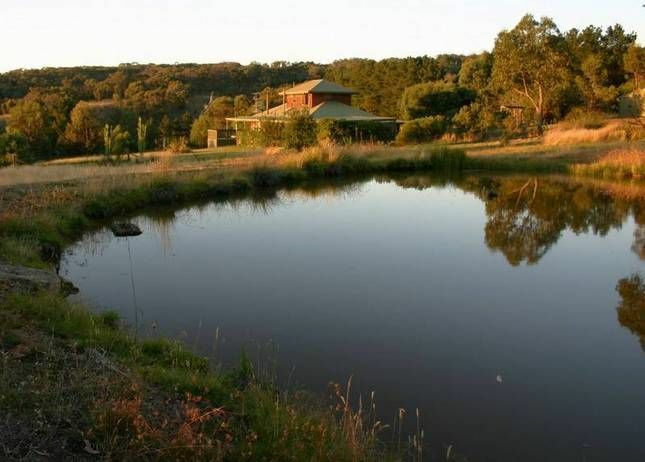 Tangerum bush retreat is in a secluded bush setting. The clean, well equipped and comfortable house has wrap around verandahs which means you can choose your place for dinner or relaxation to suit the weather and the time of day. There are lovely views. We very much enjoyed our stay to celebrate a family member's significant birthday, despite the gas running out in the barbecue five minutes after we started cooking our well planned seafood barbecue birthday dinner. A bit of a downer! Our two dogs loved the open space and swimming in the dam to cool off. There is plenty of local wildlife though the wombat visiting the dam was extremely ill with mange, which we followed up with wombat rescue folk in town. This may be of concern for people with dogs as it appears that wombat mange is prevalent in the area. The games room is helpful especially if you have children. However, the dam is easily accessible by children and animals through the large hole in the fence. We would happily stay here again. We are happy Veronica that your family enjoyed celebrating a significant birthday at Tangerum as many other extended families have. It was a downer that the barbeque gas ran out just as you were cooking your special dinner. Information about the location of the spare gas bottle is in the compendium in the house and we are always very happy to receive calls from guests if there are any queries about how things operate in the house. Thank you for taking the care in relation to the wombat - we were not aware that there is mange in the area. There is an abundance of wildlife in the area and the property is for rest and retreat rather than farming so yes there are holes in the fences! The large and secure veranda provides plenty of sheltered play space for dogs and children but both need supervision of course around the property. We are grateful for the feedback and happy that Tangerum has been the site of another happy family stay! Thanks Alison, we would be delighted to welcome you back any time! Apart from being kept awake with 2 Bats flying around after midnight in 3 separate bedrooms during our 1st and 2nd nights of our 3 night stay. Cleanliness was poor in some rooms..
Too many Cobwebs, Dead bugs etc ... and areas in the bedrooms that have Not been vacuumed properly for a long time. Apart from these concerns it was a pleasant place to stay overall. We were very sorry David that bats disturbed your sleep during your stay. As discussed you are the first tenants in over 10 years of hosting to have had this issue and we will ensure that there are no gaps in eaves to avoid this happening again. I believe the cleanliness issues were mainly confined to one room behind beds and this will absolutely be attended to. We work extremely hard to keep the property in tip top shape for our guests as 50 other reviews will attest. I am very glad that your group still enjoyed your stay at Tangerum. Since our Hol we have been doing all the "January' things & have a new smaller Laptop. Taking a lot to get the hang of it after 12 years with the last one. Fantastic venue for a large family gathering. The house is so comfortable, love the views from the verandah, especially the colourful sunsets over the hills. Some of us snowboarded at nearby Mt Buller while others enjoyed a stroll around the property, or raided the games cupboard. Thanks Julie for making us feel so welcome! Thank you so much Heather, look forward to having you and the family back again! We had a great stay at Tangerum! Gorgeous house and surroundings with everything you need. Short drive to Mansfield. Will definitely be back.